This Currier and Ives lithograph, The Village Blacksmith, shows a country village scene in summertime. If you look closely, you can see a man inside the blacksmith shop working hard in the foundry while another blacksmith works away at the anvil outside. The village blacksmith was an important role in any town in the 1800s as most people needed the blacksmith’s services to fix wagon wheels, make or repair farming equipment, and create any of the iron household tools in use like fireplace tongs. In this scene children play at the door and frollic in the dirt lane into town. It looks like a lovely summer day and the beautiful colors make one think of simpler times. 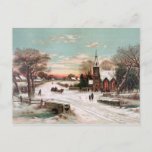 This lithograph was one of a series by Currier & Ives to capture village life in a beautiful, but realistic way. 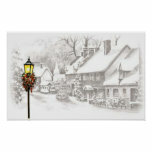 The lithograph, The Village Blacksmith, is also available in print as part of the Vintage American Scenes Wall Calendar at our Zazzle Store.